The country is under a nationwide snow and ice yellow weather warning until midnight tonight, with wintry showers set to bring up to 3cm of snow in some areas. Temperatures could drop as low as -3°C, warn forecasters. Today will be bitingly cold throughout the country with a mix of sunny spells, broken by sometimes heavy showers of rain, hail, sleet and snow. There is also a slight risk of thunderstorms. Drivers have been advised by the Automobile Association to exercise caution, especially in the west and north. 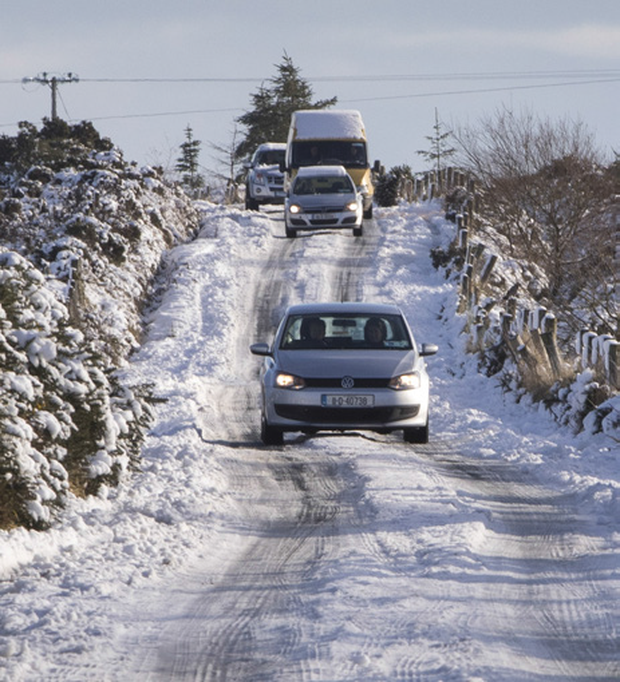 A build-up of snow will be highest in Ulster and north Connacht. Temperatures will barely reach four degrees during the day and west to northwest winds will make it feel even colder. Wintry showers will continue tonight with accumulations of snow in places so commuters and parents on the school run are advised to give themselves extra time tomorrow morning. Frost and icy patches will also develop with lowest temperatures of 0° to -3°C so driving conditions could be difficult. Tomorrow will also be cold, though, with sunny spells and southerly winds that will get stronger later in the day as temperatures climb to between 4°C and 7°C. Rain that will fall as sleet and snow will develop in the west and spread eastwards through the evening and up to midnight. Conditions will clear overnight, though the threat of occasional wintry showers remains with frost and ice on Tuesday morning causing temperatures to fall to between 0° and -3°C. The rest of the week will be cold with some winter showers. The odds of this month being the coldest February on record in Ireland were cut from 100/1 to 50/1 after a flurry of bets, but hopeful punters will need temperatures to reach the -17.8°C mark which would land their bets. Given the below freezing temperatures expected, it's worth remembering some tips from the AA. It advises motorists to give themselves extra time to de-ice their car and allow for traffic delays. And don't forget to give your battery extra help. Start the car first and don't switch on other electrics until after it has started, and fully clear all windows of snow and ice using a scraper and de-icer. Remember, stopping distances are 10 times longer in ice and snow - gentle manoeuvres are the key to safe driving. When driving uphill, avoid having to stop by waiting until it is clear or by leaving plenty of room between you and the car in front. Maintain a constant speed, choosing the most suitable gear in advance to avoid having to change down on the hill. When driving downhill, reduce your speed before the hill, use a low gear and try to avoid using your brakes. Leave as much room as possible between you and the car in front.